Traffic source (white-label) is a setting you can use to brand your hits or mask them. There are 4 options available for you if you have a Pro or Business account. By default, hits will show up as coming from 10Khits.com on web traffic tools such as Google Analytics. With a Pro or Business account, you have 3 additional options: Anonymous / Direct, Social or Custom. Anonymous / Direct will show your hits coming from the direct source. This is similar to if you typed the URL of your website in your browser and pressed enter. 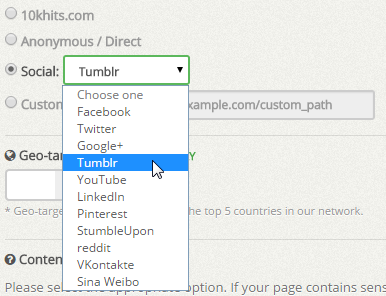 The social option lets you mask your hits from some of the top social media sites like Facebook, Twitter, Google+ and Tumblr. We will add to the list regularly so keep checking for more social sites! 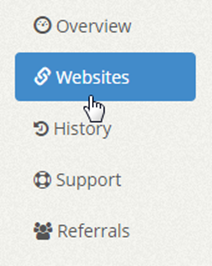 The custom source option is a way you can brand your hits with any name or URL you like. You can set it to anything you like as long as there are no special characters in it. With custom source, the hits will show up as what you’ve set in the custom box. In this example, the hits will display as coming from “mywebsite.com”.